Since having our little nugget boy, I have become fixated on cookie cutters. Like, the universe might implode if we don't have the appropriate cookie cutter to correspond to holidays, outings, activities, lessons, etc. I have amassed a bit of a collection, which isn't too hard when you can buy gigantic containers of 100 for like 10 dollars. But it isn't even the little guy who likes having fun-shaped treats. He has made it quite clear that he is completely and utterly unimpressed to receive a sandwich cut out into the shape of a truck. I, on the other hand, am very impressed by our ability as a society to provide the tools to make sandwiches into truck shapes. I'm apparently the real toddler in this parent-child relationship. That is why the gingersnap cookies are in little heart shapes. I was feeling "heartsy." I also made an owl! But I ate him before he could end up in the photo. I guess I could have given that one to Max, but lets face it, he would not have appreciated it as much as I did. I really wanted to make a pumpkin pie now that we have moved into September. And I like to pretend that there really is Autumn here in Southern California. However, making this pumpkin pie would have caused distress for Seth for two reasons. Number 1 - He doesn't like pumpkin. Okay, fair enough. We all have foods we don't like. But Number 2 - HE DOESN'T LIKE PIE! How can someone not like pie? I have no idea how that happened in life. So since I love baking pumpkin pie in a gingersnap crust, I decided to eliminate the second of these issues. Because I'm nice like that. I, however, am not getting rid of the pumpkin. I feel I compromised enough. 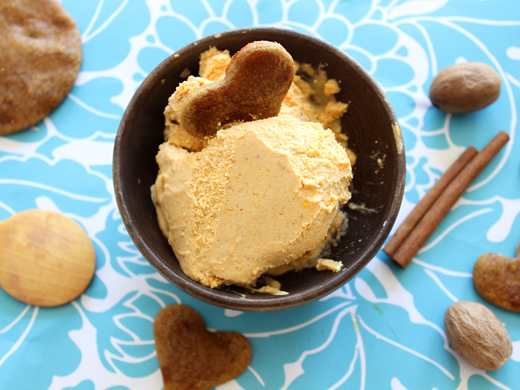 So here is a pumpkin pie ice cream into which I dipped gingersnap cookies. The ice cream is best fresh, so remove it about 15 minutes before serving if storing in the freezer. I love pumpkin anything and this sounds sooo good! This ice cream looks perfect...maybe a frozen version of the famed pumpkin-spice latte? That sounds delicious, and it's a beautiful color! I absolutely believe that the universe is in better balance when one has the appropriate cookie cutters. Like, for example, I would have made the little gingersnap cookie in a pumpkin shape to go with the pumpkin ice cream. But then again, I would have eaten it so fast it wouldn't have mattered. I really, really want some of this ice cream! Aw! I love your cookie cutter obsession. I am also impressed with the ability to make a sandwich shaped like a truck. I don't like pumpkin either...EXCEPT for pumpkin pie! This ice cream looks YUMMMYYY! What a great fall flavor in a cool dessert! Don't hate but I'm not the biggest pie love in the world. I like some, but not all. See I really like pumpkin flavored things. Like this ice cream - totally awesome. However pumpkin pie itself is just a little too much pumpkin for me to handle! Oh em gee. This has me absolutely drooling! Gorgeous!!! I want an owl cookie :D this looks fantastic. I nominated you for the Very Inspiring Blogger award! aww, thanks Abby!! that is so sweet of you, we are so honored! Oh yay! Pumpkin pie! It sounds like fall is near! This sounds fantastic! I love this. A great fall treat. I am utterly impressed by your ability to make a sandwich shaped like a truck! I would love a truck sandwich for lunch. I wonder how the 'not liking pie' happened. Is it a childhood trauma or something? lol. I think you should try and work on this. It is such a pity for him not to be able to enjoy a really tasty sweet or savory tart. This ice cream is perfect for the season and it gets to cool the still warm autumn days! Hello autumn flavors! This excites me for my favorite season more than words can describe. Jen, this sounds delicious! I am craving pumpkin desserts, I will have to make some soon to indulge in! I wouldnt be able to give up pumpkin either. For anyone. This ice cream sounds delicious! The perfect way to get your pumpkin fix. What a brilliant idea! A perfect autumn dessert. Haha! Your son is cute, but comes to think of it, I think my kids are not that into pies and pumpkin either!! I wasn't paying too much attention about that. xD What a great creation. I bet my kids will eat this ice cream and even have a second serving. Looks so delicious and I love this picture! Pumpkin pie ice cream? You are my hero! I'm a serious pumpkin addict in the fall. I just can't get enough of the stuff, and this ice cream is just perfect. I can't wait to try it. Pinned! P.S.- Who doesn't like pie? I have yet to try pumpkin pie ice cream. Super idea! I'm a huge fan of pumpkin pie so the ice cream is a definite unexpected and welcome twist. Wow! Never have made pumpkin ice cream. It looks incredible. Inspirational!